In the same family of games as Crazy Eights and Fan Tan, Go Boom is a trick-taking game that works well for both children and adults. 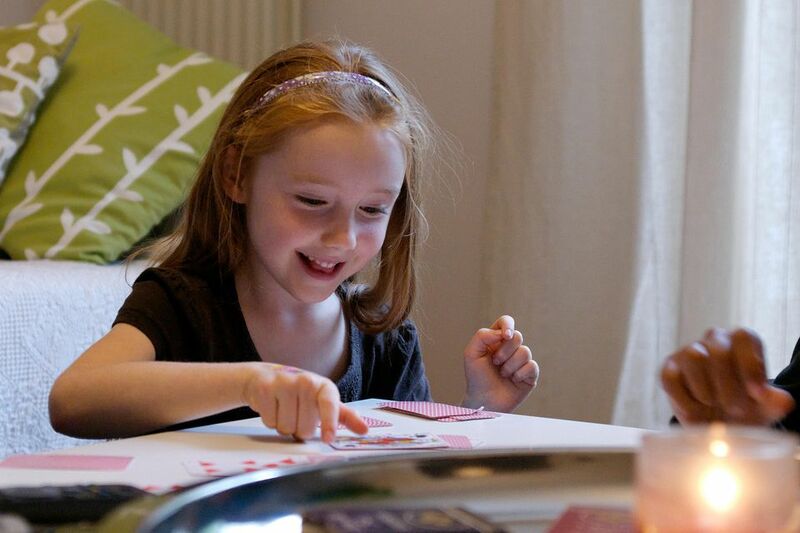 This can be a great game for young children because it only requires the ability to match cards. Go Boom, also called Dig, requires the understanding of the four suits: hearts, spades, diamonds, and clubs. So, if children already know how to match numbers, but are unfamiliar with suits, then a brief explanation of suits may be needed. The game is called Go Boom because the player that plays the last card, upon winning the game, signals the end of the game by announcing "Boom!" Two to 12 players can play Go Boom. For two to six players you need only one 52-card deck. For seven or more players, use two decks of cards. The goal of the game is to be the first player to get rid of all your cards. Choose a dealer randomly. The dealer shuffles the cards and deals seven cards to each player starting from the player on the left. The rest of the deck is placed face down in the middle of the table to form a draw pile. The player to the left of the dealer goes first. He may play any card in his hand. Play proceeds clockwise. Each subsequent player must play a card that follows suit or is of the same rank. For example, a player leads with the 7 of diamonds. The next player must play a diamond or a 7. If a player cannot follow suit or rank, the player must draw from the draw pile until a card can be played. If the draw pile is empty and a player cannot play a card, he skips the trick. Once each player has played a card, the highest card of the suit that led wins each trick. When two decks are used, if cards of identical rank are played to the same trick (for example, both Kings of clubs), the player who went first outranks the other. Get rid of all your cards, and you win. If you are playing a multi-hand game, you will need to tally your cards. The winner of the hand scores points equal to the total of the cards remaining in the other players' hands. Aces are worth one point, face cards are worth 10 points, and the other cards are worth face value. Play continues until one player scores 200 or more points. That player is the winner. Some players prefer to use a reverse type of scoring system when playing Go Boom. In this variation, at the end of each hand, each player must add to his own score the point value for the cards remaining in his hand. If a player reaches or exceeds 100, the game ends. The player who has the lowest total score is declared the game winner. In case of a tie for lowest score, the tying players are declared co-winners.